Crossed the border from Vietnam with no problems. 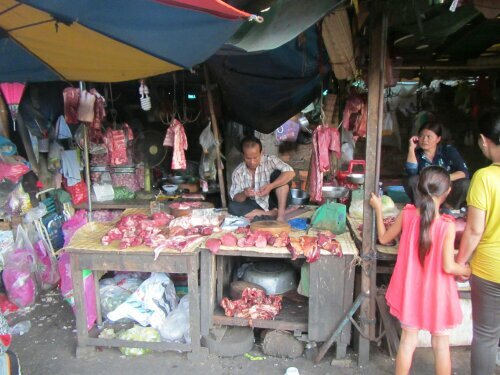 There is definitely a different feel to Cambodia. There’s more poverty. 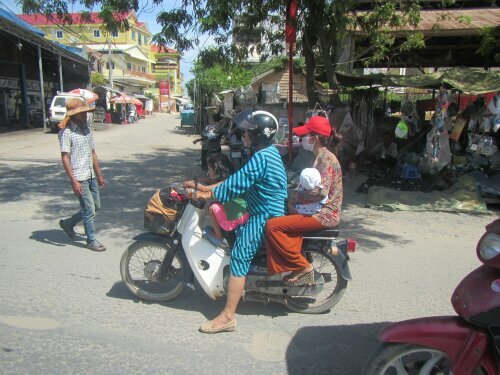 The people are beautiful and always smile genuinely, such a nice change from the feisty Vietnamese. Catherine and I met a German named Carson while going to the royal palace, so he tagged along. 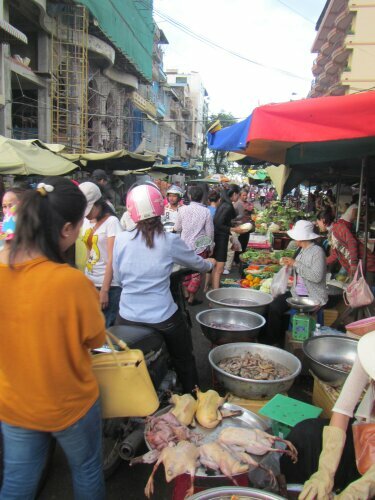 Then we went to the street market. His feet are inches away from the meat gross!! Carson talked us into going to Platoon night club. We got bottle service for pretty cheap and danced our feet off! Catherine and I got home at 3:30 am. Carson left a couple hours before us, which was funny because we originally planned on coming home early because we were exhausted, but we were having so much fun we out lasted Carson. We danced with some local girls who would go off and dance with gross old white guys. Catherine gave one of the girls a 20 to not dance with this creepy old white guy. Lol it was so funny!! Election time. Party Number 4 (rescue party) and 7 (people’s party). 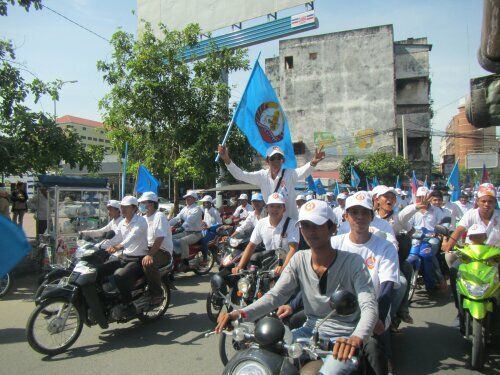 Locals parade around and with their party’s flag. A teenager on a motorbike shouted to me, “Number 4 Miss, vote number 4!” Well I would vote for number 4, but I’m not a citizen. Lol. According to a local, Number 4 is a new party, which are more like the freedom party with no corruption. 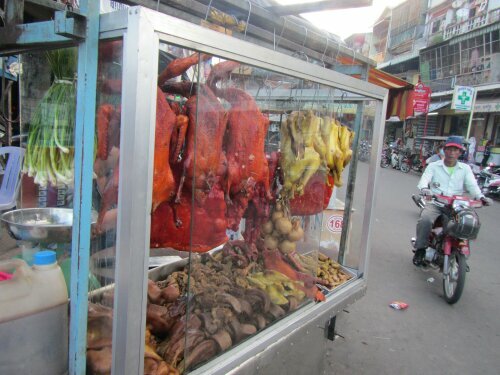 It is believed that they will gain more freedom. Time to be serious. 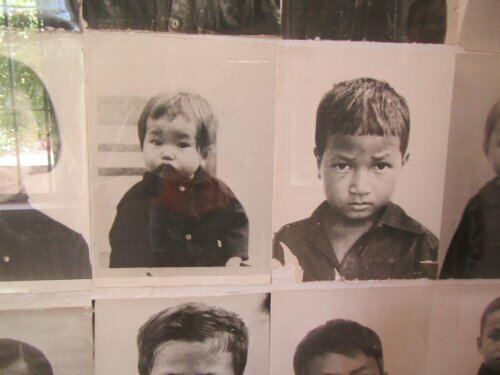 Cambodia has endured a genocide in pretty recent history. 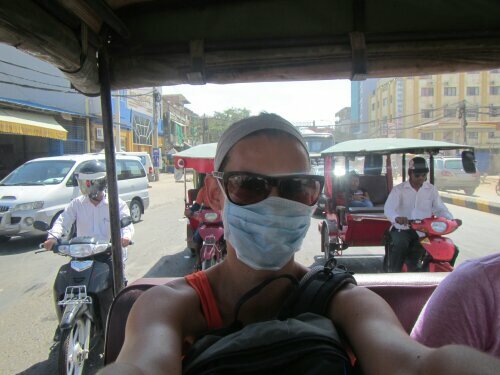 We wanted to learn more, so we took a tuk tuk, which was pretty cheap, to the Tuol Sleng Genocide Museum and the Killing Feilds. 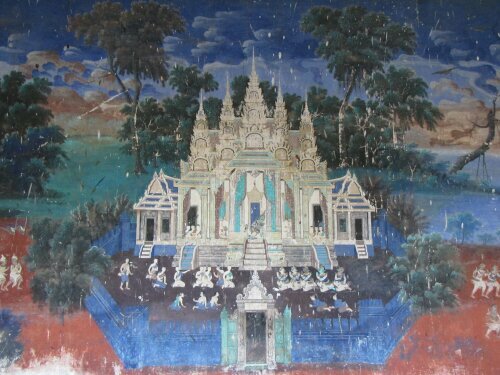 In 1975, the Khmer Rouge, tried to completely change society structure to a agricultural peasant society. Pol Pot was the leader of the mass genocide of the Cambodian people. He is a Cambodian, so he was killing his own people. He gathered an army of country workers and arrested anyone that was educated or in his eyes fallen to western ways. 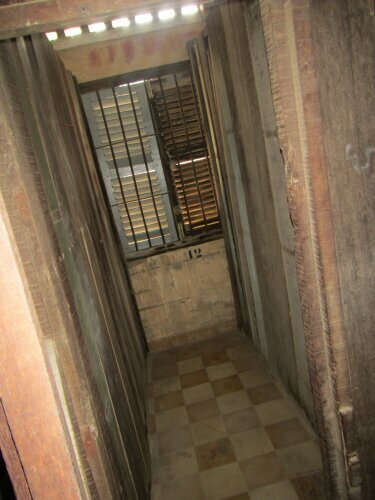 The Tuol Sleng Genocide Museum – The S21 Prison, formerly a high school, was transformed by Pol Pots security forces to include holding cells (0.8 x 2 meters) and torture chambers. About 100 people were killed a day to be punished for false accusations. 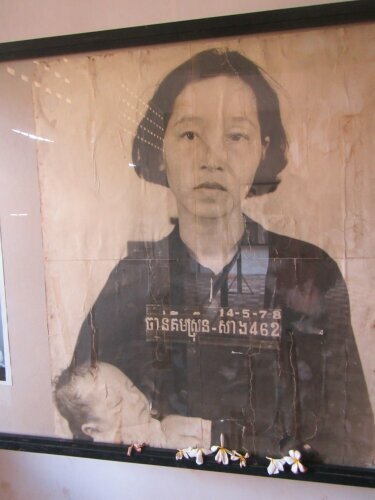 The Khmer Leaders kept detail records of all the inmates including photographs of the dead tortured bodies, which were displayed. 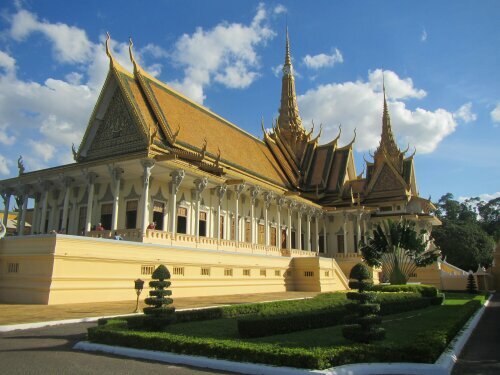 There were only 7 survivors left alive when Vietnam army liberated Phnom Penh in 1979. The surviving 7 were painters, drawers or photographers which were needed skills. 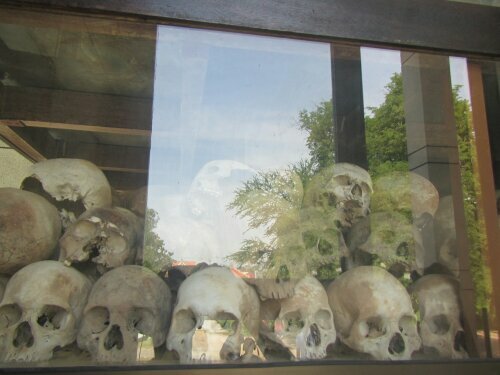 Killing fields of Choeung Ek-Most of the 17k S-21 detainees were executed in the killing Fields. Detainees included children. 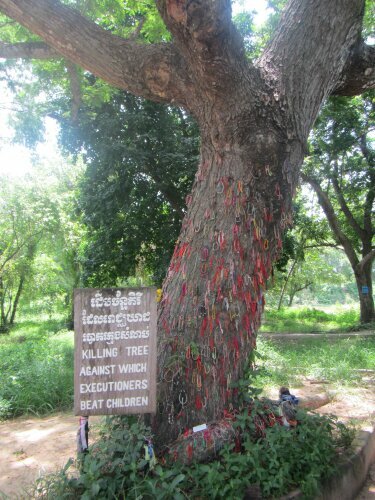 In fact, there is a tree that was used to kill small children by slamming them into the tree. Visitors leave their bracelets on the tree to show their sympathies to the victims. 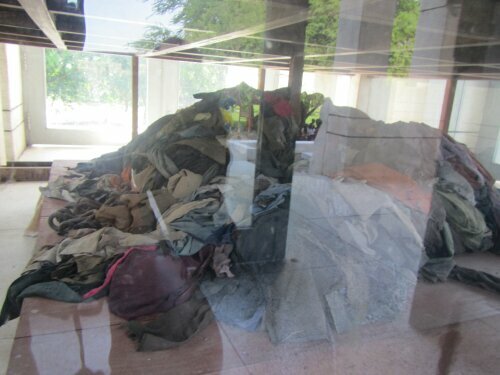 There is a display of over 8k skulls of the victims and their clothes. Each level hands different sized bones. This was a pretty emotional day, this tragedy happened so recently in history. 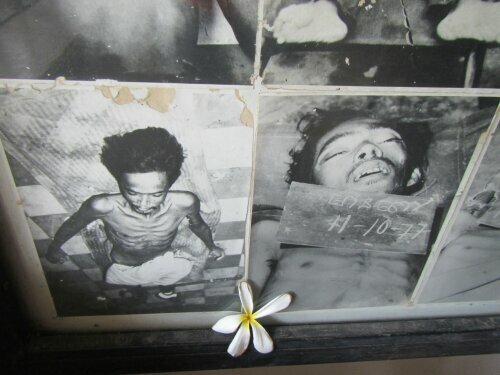 Seeing the way the prisoners were tortured and to see their photographed dead bodies was the hardest. I will never forget this memorial. 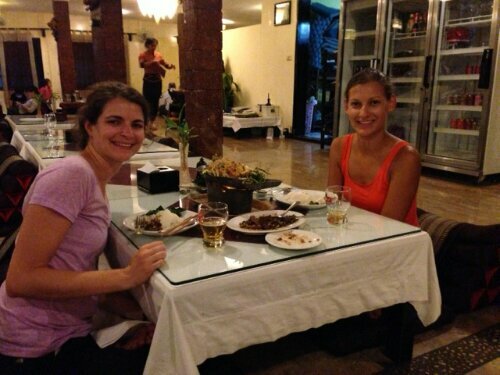 After the long depressing day, we tried out a Cambodian restaurant called Sleuk Chark where you sit on the floor. Our waiter was adorable and helped us decide on what to order. We didn’t realize that with one of the dishes we were eating had insects until we saw the contrast of their bodies against the white rice. There were big ants and big wasps. Great protein. Fish dish came out with a burner under it keeping it hot. Then we got Dried beef with sesame seeds that tasted kinda like a thick beef jerky. 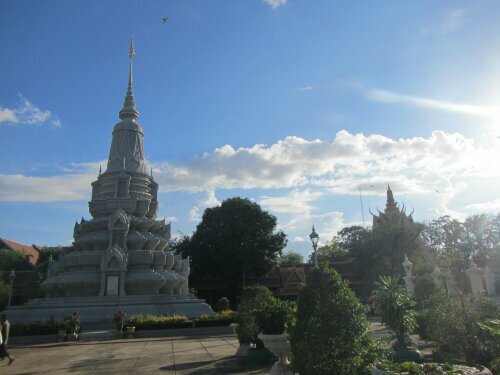 Next stop Siem Reap for some Angkor action! Looks like you were plenty busy in PP, did you visit the FCC for a happy drink and view of the river? Great spot. No we didn’t make it there. But sounds cool!